Anyway, since it's Korra, I'm still posting this and I kinda modded her costume but I made sure it's still Korra-like. I'm still open for commissions so drop me a note or comment on my profile if you're interested! Couldn't she just turn some snow into hot steam? I was thinking about that too. But that's what the commissioner requested. Maybe this is just before she remembers she could do that? Oh no! I'm so sorry! I must have missed this the first time around somehow. I really hope I didn't make you feel bad! This drawing is wonderful! It looks like a frame straight out of the cartoon. The character and background are perfect as with the rest of your gallery. The shading is expertly done; there are subtle gradients even on what look to be flat colors at first — the "unshaded" part of the shirt goes from 90/59/50/34 to 86/47/38/11 — which is the mark of a pro. And you even took the time to render lighting effects in her eyes and blend the shadows in the background. This is really top-notch work, and I'm sorry again that I missed it the first time. Thank you so much for doing this for me, and please keep up the lovely art! pshucks! Thank you so much! I'm really glad you like it. I have sent a note before with a higher resolution and unwatermarked. I'm not really sure if it got through. Would you like me to send it again? maybe she lost a truth or dare with Asami. 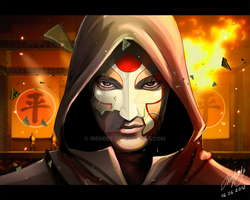 hehe Asami: Now, go stand outside, Avatar. Korra: Anything for you, my beloved Asami!